The muddy work boots, anarchic stage shows and fondness for committing musical “pure butchery” of the Wacos match up with the stylish craft and classicism of Paul Burch, a Nashville songwriting treasure. 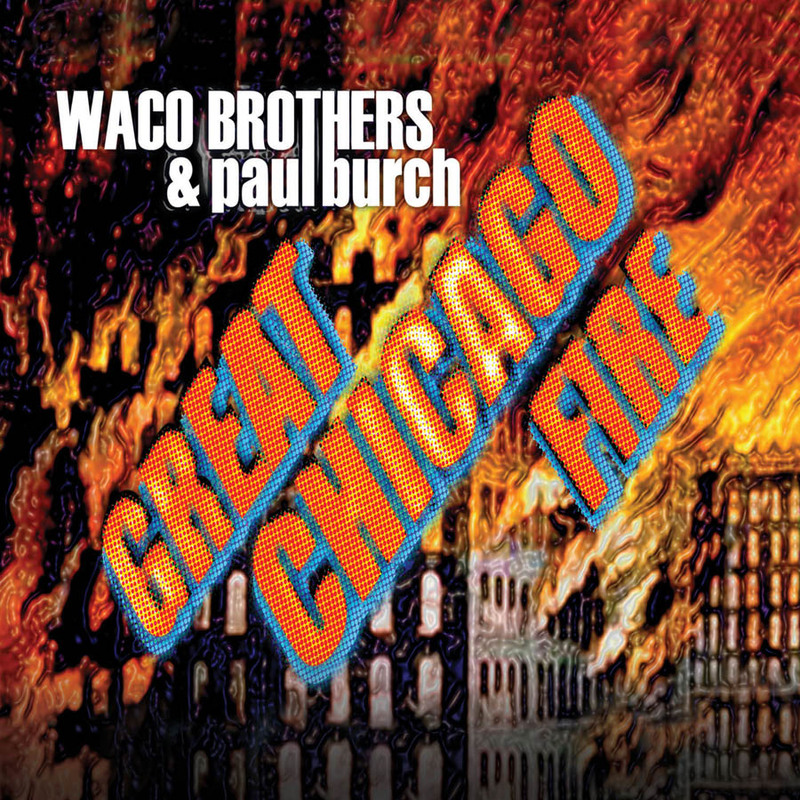 A Chicago band known for its muddy work boots, anarchic stage shows and fondness for committing musical “pure butchery” (the New York Times’ words, not ours) may seem an odd match for the stylish craft and classicism of a Nashville songwriting treasure, but that’s just what came to be on the Great Chicago Fire. Great Chicago Fire is a happy collaboration borne out of Paul Burch, a progenitor of the ‘90s Nashville Lower Broad scene, and the Waco Brothers, the Lenin-esque statue in the Square where the avenues of punk, country and rock-n-roll intersect, sharing pitchers of Guerro’s margaritas in Austin, TX at SXSW. Maybe it was the salt, maybe it was the heat, maybe it was the parade of cowboy boot shoppers and industry moguls passing before their eyes on South Congress Avenue, but two distinct creative energies decided to explore what music they could make together. Sharing songwriting, performing and production credits, it puts Paul’s voice at the front and center of the Waco mighty sonic assault; it’s a willing collision of energy and ideas, of different voices, possibilities and permutations. The sound of a group of men who grateful to be working together, happy to be playing their favorite style of music and unable to contain their excitement. Fortunately for us, they didn’t try. If Keith Richards fronted the Texas Tornados this is EXACTLY what they would have sounded like. This collaboration gives Burch’s melodies the muscle they need, while bringing a dash of class to the Wacos’ party. Bring on a second round. Witness the title track, which imagines what T-Rex might have sounded like had Marc Bolan grown up favoring dive bars and cheap beer rather than feather boas and top hats. The vigor and rowdy spirit is always looming, but never gets too intense, which works well, and allows both driving forces of the project to be heard. This is just evidence of a metric ton of talent. A bracing, wickedly smart album that draws on the strengths of both acts...If the Rolling Stones were still making great records, this would be it. It's just as insurgent as Bloodshot typically promises but Burch brings a less boozy vibe to the sessions that nonetheless remain loose, vibrant and crackling. Country rock done right, ie: without anyone taking themselves too seriously. Waco Brothers, "Death of Country Music"
Waco Brothers "Do What I Say"
Paul Burch, "Bad Girl She Used To Be"
Waco Brothers "Walking On Hell's Roof Looking At The Flowers"
Paul Burch, "Life of a Fool"
Waco Brothers "Plenty Tough Union Made"
Oft performed, never recorded...here's a raw-kus collection of mutilated covers from the ample arsenal of the Wacos. A rousing 12 pack of songs from a band not unfamiliar with 12 packs. This is one helluva party platter packed with classic singalong athems from their first 5 albums. Cuts about dismantling democracy, going for a drink, golfers disguised as national leaders, and meeting the enemy head on with a good, hair-raising, boozy cackle. Compositions that put the rhythm and color of country into new and beautiful combinations. The Wacos find fresh ways to gleefully and despondently tell it like it is--the warts, the injustice, and the crushed dreams--without batting an eye or spilling a drop. A few thousand volts of roots rock moxie, punk disgust and country heart, and whether you're innocent or guilty you can still be sure that with this electric chair will get your attention. A glimpse into the future where seemingly disparate influences like Hank Williams, Mick and Keith, Jimmy Cliff, and Morphine share rounds. High-lonesome spit and three-chord frontal assaults. Includes the chilling and exciting version of Neil Young's "Revolution Blues"
A roots-punk must have. Brimming with grim romanticism, and joyous, near ecstatic, drunken stomps. Join the cause as the Wacos strip the fat and greasepaint off country music's carcass and build a pagan temple out of its bones. Debut CD: A perfect excuse to raise your glass and curse your boss. Pick it up and yell along, because, like us, you're mad as hell and you're not gonna take it anymore!!! First Waco recording: their two-fisted ode to our country's political and moral decline backed by their blazing rendition of Jimmy Cliff's country anthem. Full of soulful urgency and longing, conjuring the ghosts of mates-in-spiritual-arms from Dylan Thomas to Johnny Cash. Stacked with a sharp lyricism and gritty fatalism that looks off the front porch for inspiration and has the locked down groove of a band on top of its game. Few have been better over the past 30 years at crafting truly irresistible hooks than GP and this album has more good ones than a Sugar Ray Leonard fight. His pen is as sharp as ever, as is his effortless coupling of punk’s energy and American R&B and soul’s swagger.